You are very welcome. Please keep us updated on your project, would love to see some photos when it's complete!! From design suggestions to the install the work done by Ace Copper was exceptional. Would recommend to anyone. Would hire them again. We have recommended Ace Copper Specialists for many of our high end custom homes and have been impressed by the quality and innovation this team brings. Good communication , attentive staff. clean and punctual. Value engineering added ideas a bonus on the project. 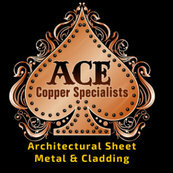 We have enjoyed a great relationship with Ace Copper for many years.